This is my first serious attempt at a sketch. I really enjoyed the process, it really made me focus and be certain of what I was seeing. I'm resolved to make at least one sketch per observing session from now on. That is a fine sketch of that bright planetary nebula in Gemini. 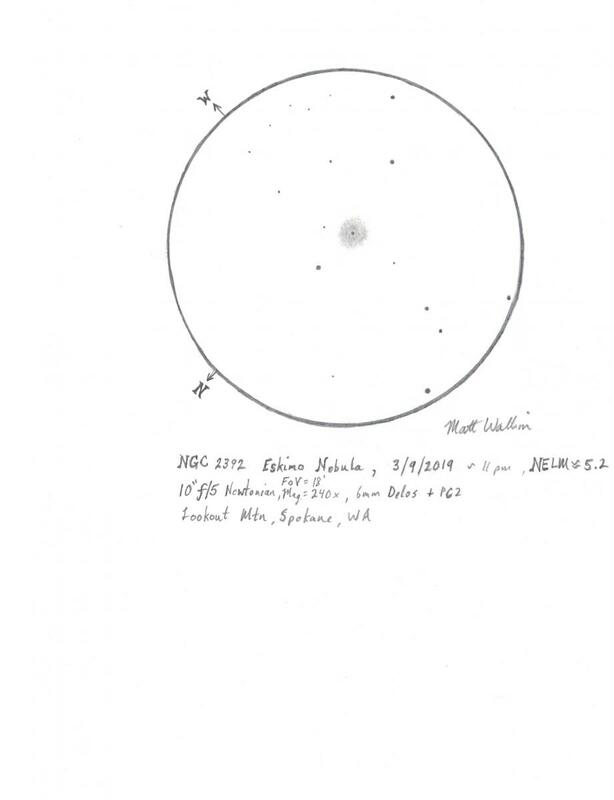 Nice sketch of NGC 2392, C39, The Eskimo Nebula . Thanks for the encouragement, gentlemen. I'm lobbying to have my club's newsletter include sketches with along with the photos in the gallery section. I always enjoy a good rendition of the visual observing experience, so I'd like to encourage more club member to sketch, but to paraphrase Ghandi, I thought I'd better start doing myself before being a real lobbyist for it. I tend to think of sketching as, well, observing. No better way to do it and to document your visual experience. Wow, that's great! I have never tried going up that high of a magnification in that same scope as yours, have to try it. Have you tried using a nebula filter on it yet? Globular cluster C39 in M 33 galaxy, is the alone GC visible with a 10". REC: I did put my UHC filter on at various magnifications, but the image was just too dim at high magnification to improve the view. You should definitely try higher magnifications on many DSOs, galaxies and PNs especially. Yes the image gets dim, but as long as there is enough contrast, you will see more detail when you magnify enough for the poor resolution of your averted vision to pick things up. "Visual Astronomy of the Deep Sky" by Roger N. Clark is a great book that inspired me to really explore higher magnification for my DSO observing. Bertrand: That is fantastic observation, and a great sketch. 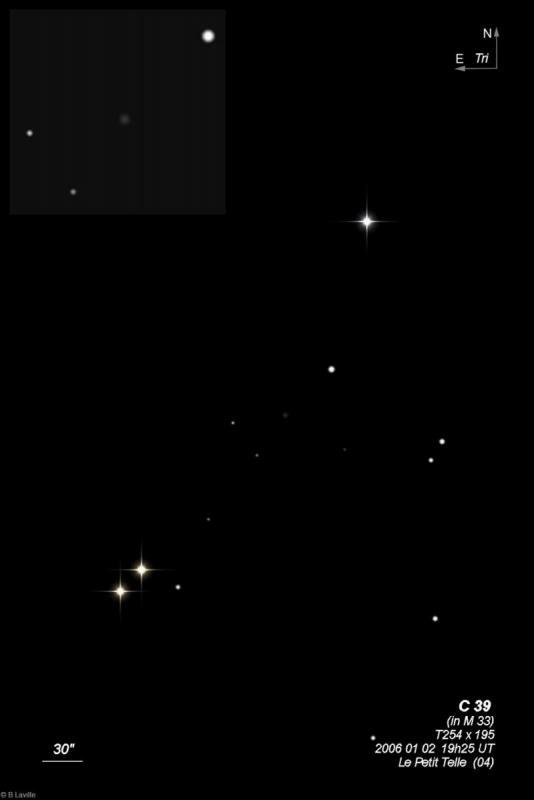 It appears from your webpage (though I don't speak French) that the deepest star in your drawing is m17.1(v)? That is astonishingly deep for a 10" scope, I surmise you had optimal conditions, and some very sharp eyes as well! I find 14.8 to 14.9 to be my limiting magnitude under good conditions in my 10" dob. In my website you can choose your language, among more than twenty ones, by listing the country you want in the window which is in the blue bar just under the header image, and more precisely, under where is written my own name "Bertrand Laville"
Moreover, v magnitudes (visual) are a bit different from V magnitudes (Cousin): mv = mV + 1/3 (mB-mV).